Sky Harbor Resort is a large cabin rental community off the Gatlinburg – Pigeon Forge Spur. These resort cabins boast Smoky Mountain views to semi-secluded wooded settings, experience tranquility in this park like atmosphere. One of the resort cabins most desirable qualities are their unique location to Gatlinburg and Pigeon Forge. Just off the Gatlinburg Spur, guest are afforded convenient access to both cities filled with attractions, live shows, restaurants and so much more to see and do. 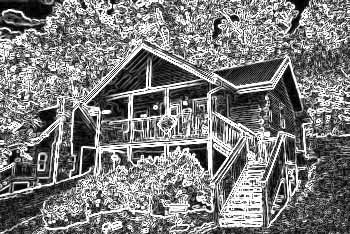 Sky Harbor Resort Gatlinburg hosts a wide variety of affordable cabin rentals for varied tastes and budgets. Large ponds and creeks dot the resort landscape and provide wonderful photo opportunities. SAVE with Cabins USA! Book your Sky Harbor Resort cabin rental ONLINE and receive immediate savings on your vacation rental in the Smoky Mountains of Tennessee.